From its beginning in 1996, Outline Products saw the need for floor covering removal, especially procedures that did not damage existing surfaces. The manufacture of compatible blades and cutters achieved this goal. 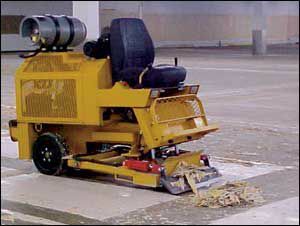 In 2003, Outline Products invented the 3500 XLT, a floor scraper attachment for full-sized skid steer tractors and track drive walk-behind units. Skid steer units are available for rent nationwide and the detachable floor scraper made floor covering removal available to all contractors. Other skid steer attachments, the Model 3200 XLT (a bi-directional scarifier) and Model 948 Bearclaw Concrete Grinder (a horizontal rotary elastomeric and underlayment remover) completed the coating-removal process.